What will the Graphics Shop of the Future Look Like? However, the printing and related packaging industry is heavily fragmented, a fact that, ironically, is its great strength. Among automobile makers, for example, just a dozen or so companies control the vast majority of the market. In printing, legions of small- to medium-sized companies employing from one to several hundred people form the bulk of the market — with “big end of town” players such as RR Donnelley in the United States (US$11 billion sales) and PMP here in Australia (AUD$812 million) [BC1] — and find it hard to serve the diverse printing needs of smaller businesses, so they concentrate on high-volume catalogue, magazine, government and promotional work. The printing industry is full of mom-and-pop shops and medium-size enterprises, leaving a big gap up to the big, often stock exchange-listed companies. Another great strength of printing is its diversity. Look around any room anywhere and you are likely to see at least a dozen kinds of printed items. The shirt or blouse you are wearing could be screen, digitally or dye sublimation-printed. The picture on the wall could be an art print; the rug could be printed on a flatbed UV machine. There may be a logo-printed coffee mug sitting on a table with faux woodgrain-printed laminate; a plastic shopping bag might have a flexo-printed store name on it. A printed box of cookies might be tempting you with the coffee that came in an espresso pod with printed lid. The roller blinds or curtains could be printed, even the wallpaper, cushions and shoji screens. All of this before we have even mentioned books, newspapers and magazines or looked inside your purse at printed dollar bills and credit cards, maybe a photo of your children. The perception that printing is “all about words and pictures on paper” may have been true in Gutenberg’s time and for a few centuries after but, since the Industrial Revolution, it has become an integral part of humankind’s existence with touchpoints for almost everyone, every day. The good news is that with the advent of digital technologies, areas of print that were once closed to the small- and medium-sized businesses because of the high cost of entry and long print runs are now opening up. Even large companies sometimes want just a few of something printed. An example of this might be satchels and folders for a company sales conference, a couple of roll-up banners for the stage, some baseball caps for the golf outing and awards or certificates for the high achievers. In the middle of all this opportunity, we still have print shops that focus on A4 and A3 sheets as their main commodity. There is still good demand for products that fall into this category and also for offset-printed work on larger sheets and in higher volumes. To put it another way, the sun is still shining but new galaxies have been discovered. In 1962, Canadian academic Marshall McLuhan published “The Gutenberg Galaxy” in which he asserts that the invention and spread of the printing press created a new being, Typographical Man. This new persona left oral, tribal culture behind, transcending “manuscript culture” where a select few powerful scribes controlled information, and formed the kernel of modern, educated and literate societies that began with the Renaissance. All because of printing. Where will print fit in? But where does the Graphics Shop of the Future fit into this entire digital maelstrom? What would McLuhan, as an avid fan of print media, say or suggest? The answer is found in the final chapter of his “Gutenberg Galaxy”: “The plight of mass man in an individualist society.” He claims that printing and typographical media made individuals out of us and we are still individuals but media is being reconfigured as a new mass electronic “galaxy” of its own. Within this co-existence of technologies, the individual still has a voice and strong desire to be recognized as an individual. “Multiple transformations are the normal consequence of introducing new media into any society,” says McLuhan. If he were alive today (he died in 1980), McLuhan might want to walk into a modern small- or medium-sized print shop and see that he can obtain far more than ink/toner on paper sheets. He might be attracted to the unique dye-sublimated Hawaiian shirts on the rack, or note that he can order a large hanging banner for his next lecture. He’d be pleased to walk away with 50 pens printed with “I attended a McLuhan lecture and all I got was this pen.” Coffee mugs emblazoned with his face and “The Medium is the Message” would be a must. Maybe a limited edition of one of his paintings, printed and stretched on canvas then signed, would impress him. He would not be able to resist keyrings with pictures of his children (he had seven) or a dozen photobooks of images from his iPhone to share around. He could walk out with a personalized cover for his iPad. The print shop of the future will have a foothold in both the Gutenberg and Electronic galaxies. It will print, bind and deliver documents to other businesses, but it also will offer to print on anything — even if this is outsourced. “If you think it, we can ink it,” could be a slogan. Its customers will come from way beyond just the local community. Web to print knows no geographic boundaries: One Australian company is sending digitally printed photobooks of iPhone images to the Middle East and beyond. There will still be specialists, but digital print will be their main game, such as digital textile-printer Next State Print. Others might focus on particular industries, such as sports, healthcare, food and drink labeling. 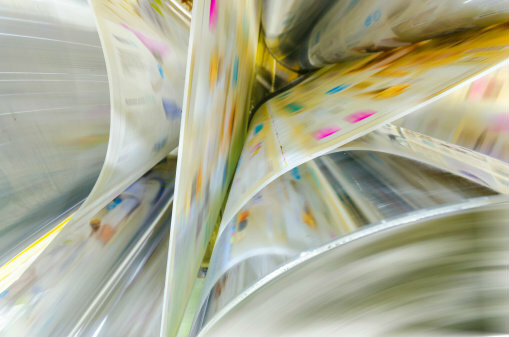 Where the future of print is concerned, it’s a galaxy of opportunity out there.